Being a heavier person, have you ever woken up from that unpleasant feeling of sagging into your mattress? Or with a backache or even a headache? If the answer is yes, your mattress is probably not good for you. But worry no more: I’ve prepared 7 best mattresses for heavy people. Each of them offers great comfort and support levels, so start reading and pick your perfect bed! What type of mattress is recommended for heavy people? Please accept my recommendations regarding mattress designed by Avocado. It suggests you the luxurious feeling of cress for heavy people. 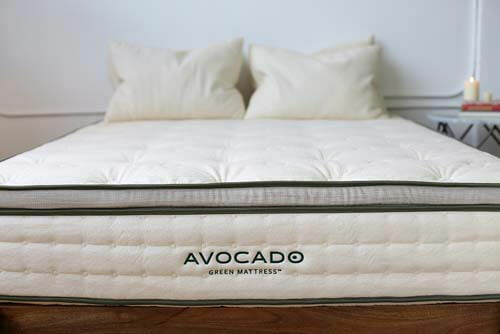 Avocado has all the right to be called the best and the safest mattress for plus-sized sleepers. It offers a great support level and a proper spinal alignment, which promise the benefits for your well-being and a superb comfort. Additionally, this is a green mattress, which means it is made of natural and safe materials. To me, that’s an awesome combo of features. GOTS-certificate proves high quality of natural material used in the cover. Airflow allows it to breathe easily and give you a smooth feeling. Joma® New Zealand Wool. It is specially designed to avoid any heat retention. Dunlop Latex layer suggests you required and constant support throughout the night. Coil system is constructed specially to provide obligatory support for spine alignment. Motion isolation is on the high-level thanks to coils location. Base Dunlop Latex plays a foundational role and improves the firmness necessary for comfortable sleep. Thanks to non-toxic and 100% natural materials, my dream was uninterrupted and bright. Latex proved by American certificate provides soft comfort. Coils pocketed in zones guarantee proper support to your tired spine. Not everyone likes too firm option during the sleep. I didn’t like as I am a side sleeper. I prefer when mattress contours my body. What makes this model the greatest latex mattress for overweight people is, of course, its construction. Because this is a 100% latex model, it is very bouncy, resilient, and supportive, which makes it ideal for different sleeping positions. Additionally, it offers a decent amount of sinkage, offering some pressure relief and superb relaxation. Talalay latex is designed specially in order to give you cooling feeling and required comfortable sleep thanks to five zones. Thicker next layer of the same latex is constructed to provide a high level of pressure relief and support. One more Talalay layer acts as a transitional support and at the same time, it is created to guarantee immediate push support and respective firmness. The base layer is usually great support for above layers, and, in case of the flip, it can be comfortable as a top layer. Organic cotton is the material of the cover, which guarantees breathability and smooth and pleasant feeling. Joma wool is on each side of the cover and it is able to pull heat away while you are sleeping. Moreover, such wool has hypoallergenic facilities. Latex tends to contour to the area around your body with less of a defined hug. ZenHaven can propose you two option of firmness: plush (4.5-5 out of 10) and firm one (6.5 out of 10). I have tested both versions of firmness and explored that 100% latex is able to guarantee more bounce with the best cooling effect. Due to implemented five zoned system you can be confident in support of your spine, especially if you have not standard weight. It was really hard to me to sit on the edge. Motion isolation is not on the best level. You should take it into account if you plan to purchase it for couples. This mattress will not give sinking feeling as memory foam. Leesa is a famous foam mattress, and there’s a reason for that. It makes a great bed for many users and can easily be considered the best memory foam mattress for heavy sleepers. Thanks to its dense support core, this model offers superb comfort, generous cradling, and great support. Additionally, the hugging properties of this model help with pressure relief, which is great for relaxation and even pain relief. 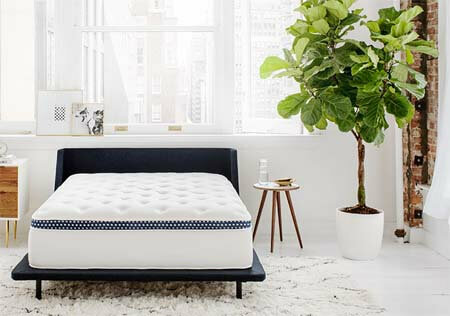 The fascinating designed mattress is crafted with three premium foam layers. Avena foam is patented material, which performs amazing characteristics similar to latex. It means that it has wonderful bounce, the absence of heat retention due to proper air flow. Durability is one of the additional bonuses here. Memory foam next level is able to provide deep compression support. High-density foam guarantees that all above layers will be in supported well. One of the benefits is breathability. The cover can amaze you by luxurious design, thick material for affordable cost. Poly-lycra blend fabric creates the feeling of exclusiveness and softness. The stretchy and cooling effect is guaranteed to you throughout the night. 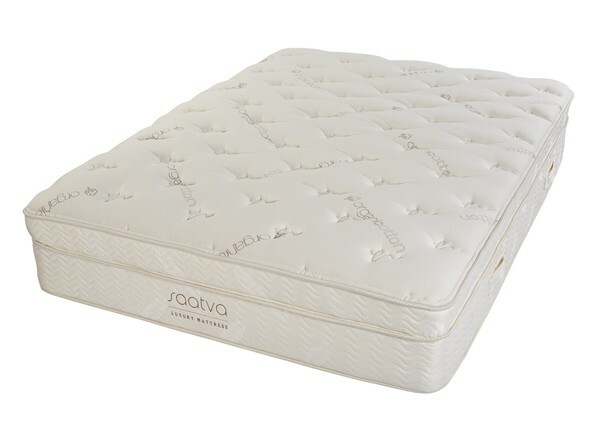 As a side sleeper, I enjoyed sleeping experience thanks to medium firmness and patented foam. Incredibly designed cover stands out from other ones by its exceptional fabric and features. You may not like only one option of firmness. Moreover, it seemed too soft while I was sleeping, especially on the edges. I expected great cooling effect from Avena foam, but there was not. What makes Winkbeds Plus stand out from the competitors is the firmness level it offers and a smart construction it features. Ideal for heavy people, this mattress is supportive enough to hold even obese couples. It is also rather bouncy and responsive thanks to its latex layer. And don’t worry, it doesn’t feel like a brick wall: the top foam cushion provides enough padding and contouring for you to feel comfortable. The mattress features a special ExtraEDGE Support System, which provides users with a larger sleeping area. The absolute best thing about this mattress is its ability to withstand a lot of weight. I mean, A LOT. You, your partner, and even your doggy (St. Bernard, for instance). The Plus model offers some extra firmness and superb support, which is so important, especially if you weigh more than average. As for the drawbacks, the biggest one is the noise level. It’s not that extreme, don’t worry. But it’s still rather noticeable, even though the coils are individually encased. This might annoy some users, and I understand them completely. If you are looking for the best hybrid bed for large people, then DremCloud might be the perfect option for you. It is very nicely made, features a smart combination of layers, offers great support levels, and allows for a comfy restful sleep. And in case you still have doubts, the company offers a 365-night trial, which means you will have a whole year to see whether this mattress works for you or not. The coils feature a 5-zone support system for an enhanced comfort. 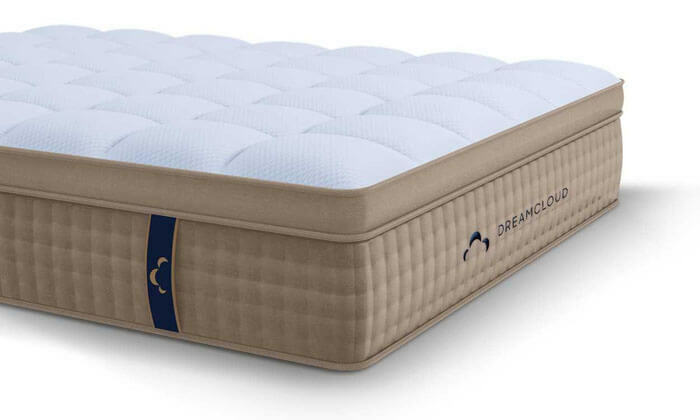 The coolest thing about the DreamCloud mattress is, of course, its hybrid construction. This model offers just the right amount of padding (courtesy of the memory foam), a great support level from the coils, and a good responsiveness from latex. So, just know this: such a construction makes DreamCloud very comfortable. The worst thing about this mattress is that it might not be suited for side sleepers. You see, DreamCloud is rather bouncy and offers a fast response, which means it might not offer enough cradling for side sleepers and their protruding pressure points. 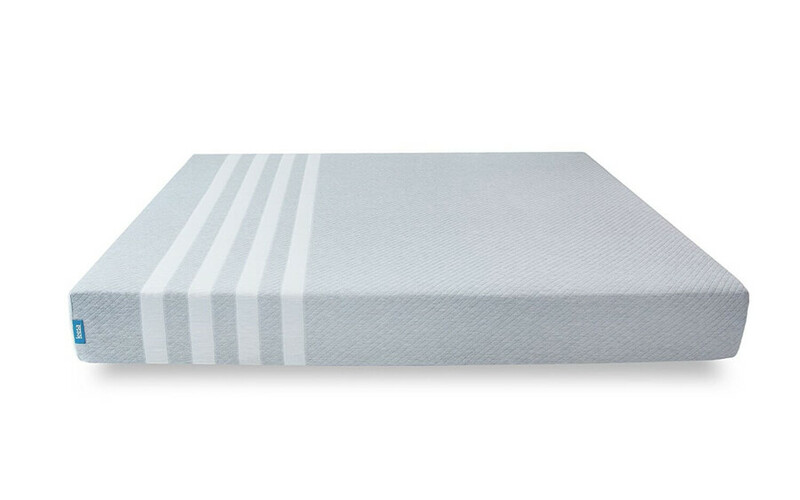 This model is considered to be top-rated mattress for overweight back and side sleepers because of its pressure relieving properties and a supportive construction. 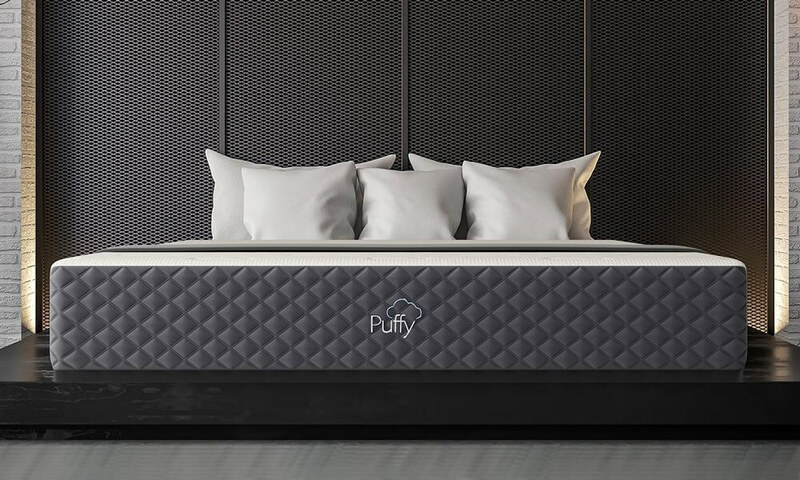 Puffy has a dense foam core, which can give your body a proper support. At the same time, its top layer is plush and very cradling, which means when lying on your back or side, all the protruding parts of your body will be gently hugged by the foam, offering relaxation and reducing tension from the pressure points. The mattress comes with a lifetime warranty. Puffy’s coolest feature is the pressure relief it is able to provide, which makes it ideal for side and back sleepers. The mattress is rather cradling. It gently hugs the pressure points, allows for a generous amount of sinkage, and makes you feel like you are sleeping on a cloud. The worst thing about Puffy is its edge support. This is a common issue for foam mattresses, of course. Still, it might be a huge disappointment for some users. The edges of the mattress very easily give in under the weight of your body, which means you will not be able to sleep there. Saatva really is a great find. And what makes it the top-rated innerspring mattress for a heavy man is the quality of its materials and construction. 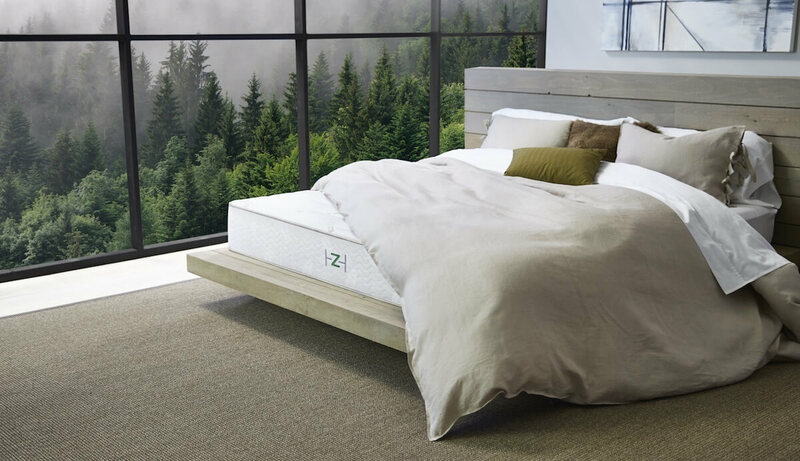 This mattress has everything you might need for a comfortable sleep: great support core, reinforced edges, organic and breathable cover, and even a lumbar support layer. It offers just the right amount of all: pressure relief, cradling, and support. The coils are made from recycled steel. The absolute best thing about Saatva is its quality. It is clear that a lot of thought was put into its design. 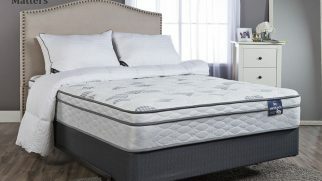 This mattress has all the best from innerspring and memory foam; it is comfortable and it’s very nicely made. That’s what makes it so great for heavier users: its quality means the mattress will withstand pressure for years. As for the drawbacks, the biggest one is that this mattress isn’t very cradling. I mean, there is some foam padding, but it doesn’t provide too much sinkage, which might be a disappointment for people who love the slow-hugging feel of the foam. We understand the importance of a good mattress. I myself struggled for years when I was younger, sleeping on a saggy, soft bed, which didn’t support my body weight and made me feel like a sack of potatoes every morning. Quality of the materials. Obviously, this aspect is very important. The quality of a mattress and the way it is made will determine both its comfort levels and durability. Therefore, we pick only the tested models that show the best results. Firmness levels and support. This one is a must if you are a heavier sleeper. More body weight needs more support and proper weight distribution during sleep. We pick mattresses with firmness levels not less than 5-6 on the firmness scale (medium and medium-firm), with a strong core layer that can handle a lot of weight being put on it regularly. Thickness. If you weigh more than 200 pounds, a thin mattress will not be able to support you properly. So, to find the best mattress for big guys and girls, we usually pick models that are at least 12 inches tall. Temperature regulation. Getting hot during sleep is one of the most common issues overweight people have to deal with. We always search for mattresses that have good moisture wicking properties and use breathable materials. Such factors will help with temperature regulation immensely and improve your sleep quality. Durability and warranty. Obviously, you don’t want a mattress that will be good only for a short amount of time. Therefore, getting a good mattress with a long warranty period is always a good idea, and we recommend only durable models covered by great warranty conditions. Edge support. This factor is important for those who tend to roll over to the edge of the bed or for people who share a bed with a partner and need a larger sleeping surface. Whatever the case is, good edge support is always a nice bonus, so we pay our attention to this aspect as well. Pressure relief. A good mattress has to have great pressure relieving properties. Why? Because when you get proper pressure relief, you are able to relax more. There is less tension on your joints, your body is in a neutral position, and your muscles experience a deeper relaxation. And all of these factors result in a better sleep quality. Value. Obviously, a good value for money is always a nice bonus. Just know this: if we recommend an expensive mattress, it is worth every penny. If we offer a cheap option, it’s still comfortable and nicely made. Only the best for you, my friend. Memory foam. Foam mattresses offer superb pressure relief, which really makes them suitable for almost any user. Additionally, memory foam comes in different density options, which means there are firmer and more supportive models for heavy users. Innerspring. Spring mattresses are very popular among heavier sleepers. They are oftentimes considered to be the best-rated mattresses for obese couples thanks to their firmness, resilience, and good edge support. Latex. This material is very bouncy and offers immediate response, which makes it a great option for overweight people. It can provide you with a good support level and a decent pressure relief. Hybrid. Such mattresses are a real find, in my opinion. They can feature different combinations of materials, and each user can find something suitable for them. There are combos like spring + foam, foam + latex, spring + gel + latex, etc. Hybrid mattresses give you the freedom to experiment with different materials and find the perfect combo suited for your particular needs. Different mattress materials have their special properties and peculiarities. That’s why, while one material might work well for some users, it can also be unsuitable for others. Let’s take a look at those types and their benefits and drawbacks. Hopefully, this will help you determine what you need exactly. Usually comes in a wide variety of firmness levels. Don’t provide that hugging feel, which some users prefer. Oftentimes, coils are noisy, which can annoy some users. Still might sag with time, depending on the materials. 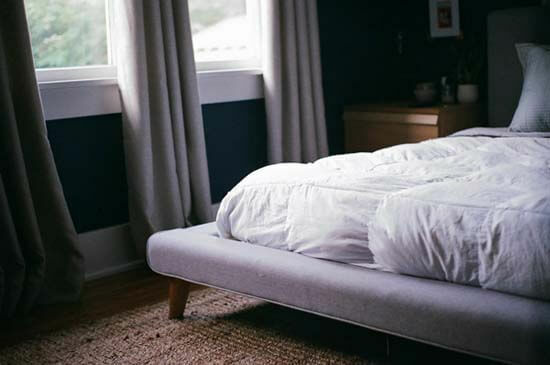 Even if you already have a suitable mattress (or have picked the one you are planning to buy), there are some other factors you need to consider. Particularly, your pillow. You see, it directly influences your comfort. Yet, a proper pillow does a bit more than that. It helps with the proper spinal alignment, which is very important for your health. Additionally, since heavier people tend to suffer from sleep apnea, a good pillow can help with this issue. Choose your pillow according to your regular sleeping position. For instance, if you are a side sleeper, you need a thicker pillow, which will be able to fill the space between your neck and shoulder and support your head properly. And if you are a stomach or back sleeper, a thinner pillow will work better for you. Sleeping on such a pillow will allow for a proper spine alignment and will keep your airways unobstructed. So, which of the reviewed items seems the most comfortable for you? Share your thoughts in the comment section down below! A few factors are crucial and should be considered for overweight or large sleepers. The mattresses observed above are able to give necessary support up to 300 pounds, some versions – to 350-450 pounds. Firmness. Generally, the mattress is intended to have three versions of firmness: soft, medium and firm. These versions are useful in order to choose the mattress depends on your sleeping positions. In our case, the mattresses which have firmness scale from 4 to 7, for example, are the great choice for overweight people as their weight has a tend to give additional sinking. The mattress with proper firm feeling gives sufficient support throughout the night. Thickness. This factor seems to be obvious, but it is worth your attention. Thickness scale should be enough in order to sustain weight over than normal. Usually, 12 inches is balance point for obtainment of deep compression support. The thicker profile is able to provide it to you. If you have a tendency to sleep near the edge of the mattress or like to spend time on the mattress during the day, sufficient edge support should be another crucial point for you if you have weight more than normal. Consistent edges are able to prevent additional sagging. Heat retention is a problem for every type of sleeper. But heavy people suffer from it throughout the night, most of all. Please avoid cheap foam mattresses in this case as sleeping experience on them is awful. I recommend looking attentively at foams which feel like latex or latex or hybrid versions which are able to give you required cooling effect and support at the same time. It is wonderful when producers are able to take into account crucial requirements of their customers. One of such demands is a comfort and proper support for people who have weight more than normal. 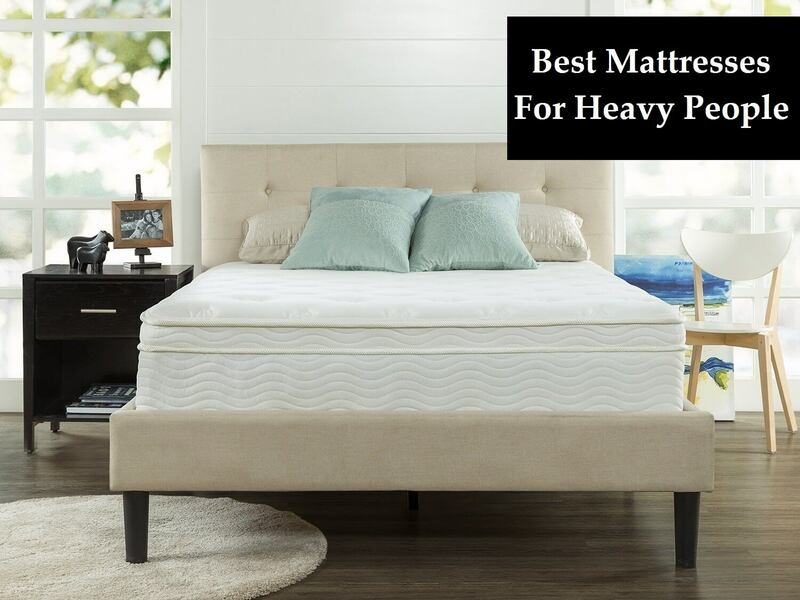 Reviews of the best mattress for heavy people have been analyzed above and presented to you in five options. You are free to choose the right mattress only for you. After detailed exploration of versatile mattresses, I propose you to look upon DreamCloud Mattress. Their hybrid version is worth your attention thanks to an overwhelming combination of individual pocketed coils system, which with foam subcomponent gives sufficient support for your weight. In the same time, your sleep will be comfortable and pleasant. If you prefer only organic material, then Avocado hybrid mattress is suitable right for you. Have you ever experienced back issues due to sleeping on a mattress that’s not suited for your body type? How did you deal with them? Let us know in the comments! 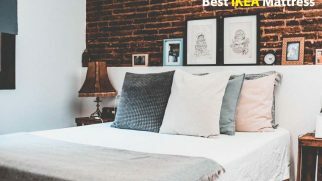 I know a few people on the heavier side looking for a good mattress so this article is actually a great guide for me to share with them! A lot of useful information! I can’t sleep without changing to different positions and only mattresses with several tensile layers can help me. I cool I stumbled on this post, I can now make a choice from the list.